Fortunately for those currently suffering from hair loss, RHRLI is available to customers in the tri-state area. We’re the only Long Island hair loss treatment center that features the ARTAS® System, an advanced robotic system that takes healthy hair from donor areas (usually the back of your head) and transplants it to where it’s needed. ARTAS® is a minimally invasive robotic follicular unit extraction (FUE) procedure. It doesn’t require scalpels or stitches like follicular unit transplantation (FUT) procedure. RHRLI is on the cutting edge of hair restoration. We thought it might be fun to take a look at some historical figures and their hair loss woes. Did you know a Biblical prophet was mocked over his hair loss? The incident appears in 2 Kings 2:23, where the prophet Elisha is taunted by young men about his hair loss while he was walking on the road to Bethel. Elisha may not have had access to robotic hair restoration technology but he did have a strong response to those who were taunting him: He put a curse on them and they were mauled by bears. One of the the most famous figures in Roman history, Julius Caesar, also had difficulty with hair loss. 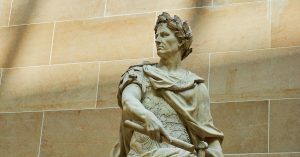 According the British newspaper The Independent, Caesar always insisted on wearing elaborate ceremonial laurel wreaths to cover up his hair loss. The American president is one of the most powerful people in the world, but that doesn’t make those who hold the office immune to hair loss. 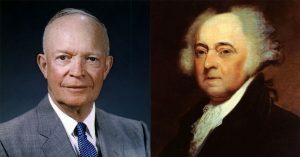 Several presidents in our history have lost their hair, starting with our nation’s second Chief Executive John Adams, who had a notoriously short temper when he was belittled about his condition. According to HuffPost, when Ben Franklin’s grandson, Benjamin Franklin Bache insulted the president for his hair loss and called him blind, crippled, toothless Adams,” the president indicted him under the Alien and Sedition Acts. Another president known for his hair loss, Dwight D. Eisenhower had a greater a sense of humor about it. The former Supreme Commander of Allied forces in western Europe during World War II, affectionately known as “Ike,” was self-deprecating when he met his treasury secretary George Humphrey, who had also lost his hair. “George, I see you comb your hair the way I do,” Ike reportedly said. History is filled with people from all walks of life with thinning hair, like famed playwright William Shakespeare, statesman Winston Churchill, and scientist Charles Darwin. While history’s books have closed for them, your personal history can change. RHRLI and ARTAS® will give you a healthy, new head of hair. Just give us a call and contact the hair restoration experts at RHRLI today.